But marrying and moving to Switzerland put Gale on a different course entirely. 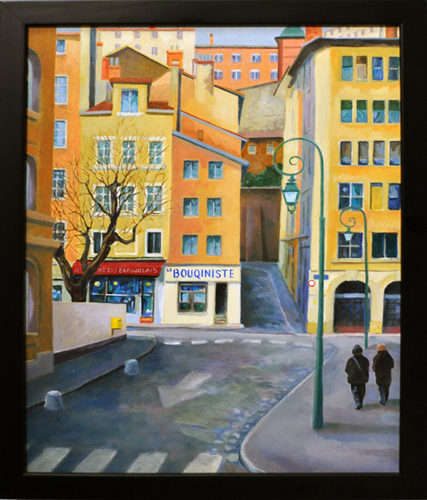 There she obtained her MA in Art History and lived amongst the chimney tops and red roofs of Geneva. 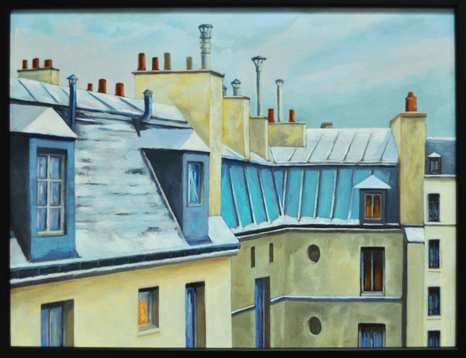 There she began a long love affair with rooftops and facades, painting with great facility in oils. Often her rooftop and sky works pull the viewer into the distance, as if beckoning one to travel to yet another faraway place. As if responding to the call of her own paintings, Gale and her family did travel to and reside in several faraway lands over two decades, moving from Switzerland to Indonesia, Moscow, Paris, Germany and back again to Washington D.C., once experiencing history, almost first hand, while residing in one apartment built in the 1580s. 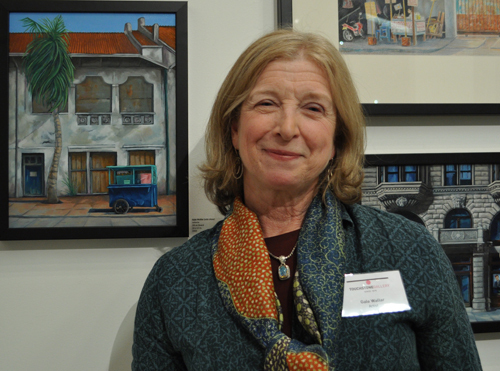 The constant in all of Gale's life has been working in oils, printmaking and colored pencil. She describes each new place in a tiny vignette, leaving the viewer to wonder just what lies behind that decorative door, what architectural details could be just around the corner, or what culinary delights might be found in the nearest cafe or deli. While each painting seems to be a photographic representation, abstraction enters the picture. Gale abstracts each location into patterns of structure, hidden geometries, and enhanced colors. The resulting images include expanding and contracting forces that show both vitality and stability. Each is a visual conveyance into another plane, an interpretation seen through her eyes and passed on to enrich ours. Being nomadic in design and composition, too.